The UK has lost seven species of breeding birds in the last 200 years. Conservation efforts to prevent this from happening to other species, both in the UK and around the world, are guided by species’ priorities lists, which are often informed by data on range, population size and the degree of decline or increase in numbers. These are the sorts of data that BTO collects through its core surveys. For most taxonomic groups the priority list is provided by the International Union for Conservation of Nature (IUCN) – the IUCN Red List comprises roughly 12,000 species worldwide and their conservation status. However, for birds in the UK, most policy makers refer to the Birds of Conservation Concern (BoCC) list, updated every six years (most recently in 2015). A new study funded by the RSPB and Natural England in cooperation with BTO, WWT, JNCC, and Game & Wildlife Trust has carried out the first IUCN assessment for birds in Great Britain. The study applied the IUCN criteria to existing bird population data obtained from datasets like the BTO/JNCC/RSPB Breeding Bird Survey (BBS). The criteria take into account various factors, most notably any reduction in the size (both in abundance and range) of populations, loss of habitats key to the species, small or vulnerable population sizes, and extinction risk. Alongside this, the criteria look to see if there is a “rescue” effect – such as immigration from neighbouring populations that might boost the population’s numbers, reducing the risk of extinction. The species are then categorised into one of the threat levels below. The results of the new study show that a concerning 43% of regularly occurring species in Great Britain are classed as Threatened, with another 10% classified as Near Threatened. Twenty-three breeding or non-breeding populations of birds were classed as Critically Endangered, including Fieldfare and Golden Oriole (both possibly extinct as breeders), Whimbrel, Turtle Dove, Arctic Skua and Kittiwake, as well as non-breeding populations of Bewick’s Swan, White-fronted Goose and Smew., Over the past 200 years, seven species have gone extinct as breeders in Britain, including Serin, Temminck’s Stint and Wryneck in the past 25 years. The total percentage of threatened birds in Great Britain (43%) is high compared to that seen elsewhere in Europe (13%). Reasons for this are not entirely clear, although it may be that Britain’s island status has something to do with this, as there are fewer neighbouring “rescue” populations. Although the results from the IUCN assessment and BoCC assessment largely overlap, the IUCN assessment raises the level of concern for species such as Red-Breasted Merganser, Great Crested Grebe, Moorhen, Red-Billed Chough (all classed as Vulnerable), and Greenfinch (Endangered). These species might thus warrant closer monitoring in the near future. 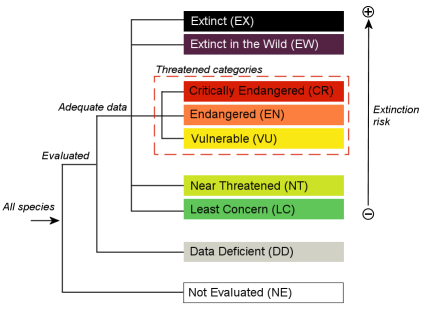 In contrast, the BoCC assessment identifies a number of species of concern whose declines have been more gradual but over long time periods (e.g. Skylark and House Sparrow). The authors emphasise that this assessment is not a replacement of the BoCC report, but rather that the two reports complement each other. With this new wealth of knowledge, there will hopefully be even more support for those species that need it most. The risk of extinction for birds in Great Britain British Birds. For more information about this publication, visit https://britishbirds.co.uk/.